I regularly do customer feedback surveys for competitive analysis purposes (full disclosure: ServiceDock is a CEM platform for multi-location businesses). For the most part, I am a genuine customer of the business when I do them and try to think as such, while also making notes on the survey solution. 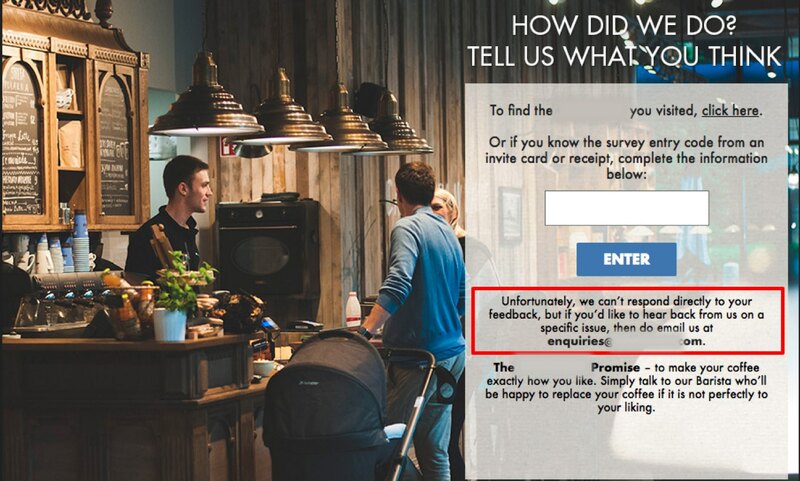 Some of these surveys can be extremely tedious and drawn out, but the most frustrating experience I frequently encounter is when I’m told that there is no chance of a follow-up on my feedback. The real irony here is that the goal of the exercise is to improve CX, but the process offers terrible CX. What is the CX of your Customer Feedback Survey? Put yourself in the customer’s shoes for a moment. A business has just asked you to spend a few moments of your valuable time to provide feedback that will help the business improve customer experience. So the business is getting something very valuable from the customer. In return, you, the customer, get a small statistical chance of winning a low-value prize, while being informed that no one is really paying attention to what you’re saying. Does that sound customer-centric to you? It’s no wonder that the engagement rates on many in-store surveys are so low (often less than 1%). Of course, it would be very difficult for any busy consumer-facing business to follow up on every piece of feedback, particularly if you're being successful at capturing it in high volumes. It would be a huge mistake to create the expectation that there will be a follow up because the resources required to manage such an operation would be significant. The goal should be to respond to as much customer feedback as possible, which in an ideal world would be all of it. Avoid promising that you WILL follow up but certainly do not state that you WILL NEVER follow up. There is nothing wrong with offering a secondary channel that will receive a more immediate response, but stating outright that the feedback being provided is not going to get any direct attention is discourteous at best. Why is Closing the Feedback Loop so Important? Why respond to feedback from promoters? It takes effort, but there is real payback on such follow-ups. Warning! Be careful not to make the follow up intrusive. Following up with a phone call, for example, can actually have a negative impact if it is timed badly and interrupts an important meeting. When I talk to potential clients, they often express concern that all they will get are complaints. In our experience that is not the case, at least where a reasonable incentive is provided. In any case, studies have shown that proactively dealing with a complaint creates a huge opportunity to increase a customer's level of loyalty. Weighing up the pros and cons of following up on at least the bottom few percent (i.e. super detractors) is an analysis worth doing. Warning! Make sure the follow up is prompt. Following up a few days after the interaction can act as more of a reminder about a negative incident rather than addressing the issue. A quick response shows an interest in the customer's issue and demonstrates that the business is actively listening. There are ways of increasing your follow up rate without going out and hiring a new customer service team. Empowering outlet managers or franchisees to follow up with customers makes the volume of feedback more manageable on a local level. This also adds value in terms of building relationships with local customers, but be careful to provide the necessary training if you go down this road. Using A.I. to respond to customer feedback automatically is fraught with danger, but implemented well it could add enormous value. However, I strongly recommend having human support involved, at least as a fallback option. Leaving the entire interaction to bots could make a bad situation worse. Getting customers to complete surveys while they’re still on your premises gives your staff the opportunity to react in real-time if they have the right tools. This is equivalent to getting the customer to make a spoken complaint and can be handled in the same way. Messaging apps offer one of the most efficient ways to close the feedback loop. They are not intrusive and the real-time yet asynchronous engagement makes it easier to respond quickly without having to dedicate staff to the channel 24/7. I have no doubt that the vast majority of businesses running customer experience surveys act on the results. I’m sure they are listening. But there is a lot of value in being seen to listen by actually responding to customers to prove it. That is probably more important than ever if you believe all the hype about Millennials being self-centred. This generation are thought to be loyal only to brands paying individual attention and providing one-to-one support to them. I’m not sure I buy into all of that, but no matter what generation you’re dealing with, closing the feedback loop is a high-value activity for your business. Your goal should be to do as much of it as resources permit.